When drilling into wood you need to drill a pilot hole first. This makes it much easier to screw into and also prevents the wood splitting. The pilot should be a bit smaller than the screw thickness. So, for example, with a number 8 screw you need a 2.5mm drill for the pilot. Checkout the table below for a list of pilot and clearance hole size. This is a guide only. The pilot hole will vary slightly depending on how hard your wood is. NB for very small screws its quicker to use your bradawl(see tools) to make the pilot. 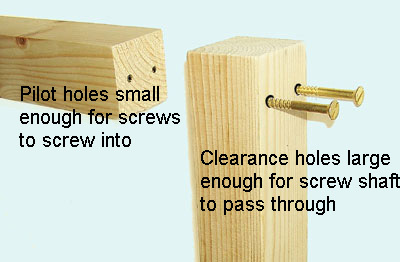 If you are screwing two pieces of wood together the top piece needs a hole that the screw clears completely. i.e. slightly bigger than the diameter of the screw.